It's not easy to be a supervisor these days. You've got to get the job done--often with fewer employees and a tighter budget. Plus, you're expected to know exactly what to do or say every time a "people problem" comes up. This video was created to help you find your way through the maze of employment laws and regulations, while at the same time maximizing the performance of your workers. This video goes behind the scenes during the first eventful weeks when a new manager takes over a team in the middle of an important project. 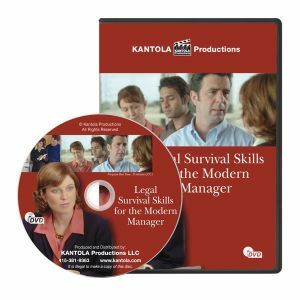 The narrator, Alan Levins, an Employment Law Attorney with Littler Mendelson PC, explains critical legal issues as you witness this manager's struggle to win the respect and cooperation of her sometimes unruly crew. An overview of the major employment and anti-discrimination laws. Legal and effective performance reviews, discipline and termination. How to stay in compliance while treating employees with fairness and dignity.